Against a backdrop of rumors that President Trump is considering firing not only Rod Rodentstein but also AG [Absent Guy] Jeff Sessions due to their horrible mismanagement and duplicitous conduct, accentuated by the recent raid on the offices of President Trump’s personal attorney, Michael Cohen, Rep Louie Gohmert weighed with his Texas wisdom. “I don’t know of anybody else that was as crushed as I was, because I knew how much damage this man did to the FBI. I would submit he did more damage to the FBI than all of the other FBI Directors put together since J. Edgar Hoover. He has been a disaster. Julie Banderas echoes the claim made by sleazy Chuck Schumer from the Senate floor, that there must be something to the unknown suspicions or the US Attorney for the Southern District of New York would never have pursued it. She asks why not subpoena the evidence, as Gohmert completely dismisses her premise as false, giving too much credit to the legitimacy and assumption of objectivity to the crooks in robes. 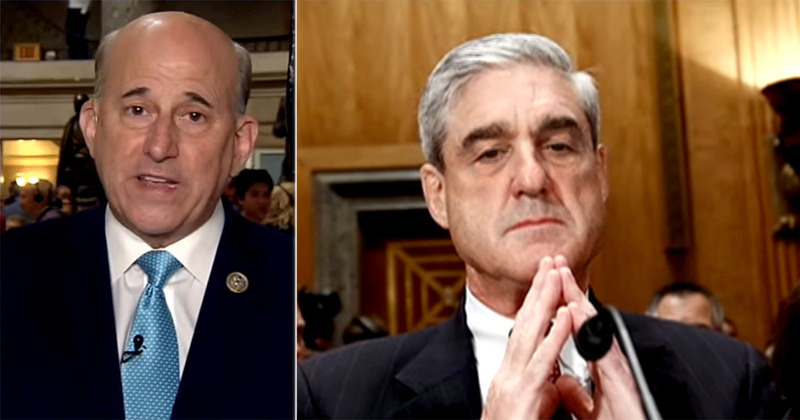 “It was a bubble-buster for me,” says Gohmert, “because it showed that Mueller and the FBI and the DOJ, they don’t care about probable cause and they can always find a judge to give them a warrant. This is all about trying to get something on Cohen.” They’re trying to get something as a means of holding prison time over Cohen’s head, to get him to turn on the President. Mueller seems untouchable and has the full ennoblement of the uni-party. If he is allowed to continue he may just proclaim himself supreme emperor, or some other POS like the big0 again. We desperately need a strong Constitutional leader. I can’t see how this is going to be fixed. America needs more protected whistle blowes to come forward. We know and see the corruption before our very eyes, but we need more proof, documents, recordings, video’s sworn testimony’s. The indoctrination, Infiltration. Brainwashing, threatening of all these people for those 8 years are huge and wide. Way to many in Congress, White House and all ABC Agency’s covering for Obama and Clinton and others that have had a hand in the destruction of Our America Justice System. One year and still waiting for un redacted documents, recordings, video’s. For ALL the Truth to come out. i voted today in a poll for this good man LOUIE GOHMERT to be the next speaker. he is also a former judge, so knows by what he speaks. Trump NEEDS to take his advice. FIRE ALL OF THEM, THEN HAVE THEM INVESTIGATED.